Photo courtesy of Ray Purdy. Bathroom sign found at National Taiwan University. 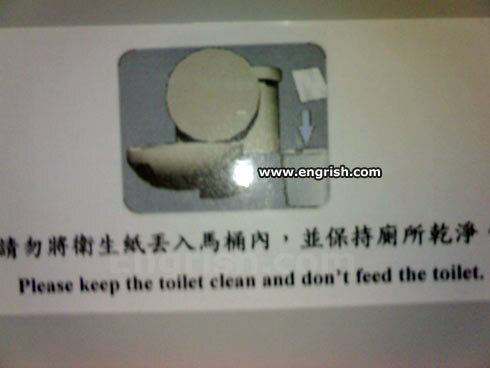 Is the toilet like a seagul, were it will never leave you alone if you give it any food, and on that thought- is crap food for toilets? Whoops. I already tipped that junk they gave me at the petrol station sandwich bar. My toilet begs at the table. What poop does the toilet eat? may i feed the urinal? But how can we not feed it? Or else it gets the hose again !! What do toilets eat anyway? Don’t sue us if you lose your hand to the flush monster. Give an old saying “Don’t feed the Troll” a new meaning! Oh … It’s a Zoo toilet. Can I pee on it?